Shy buds of white ranunculus gaining courage to open up. 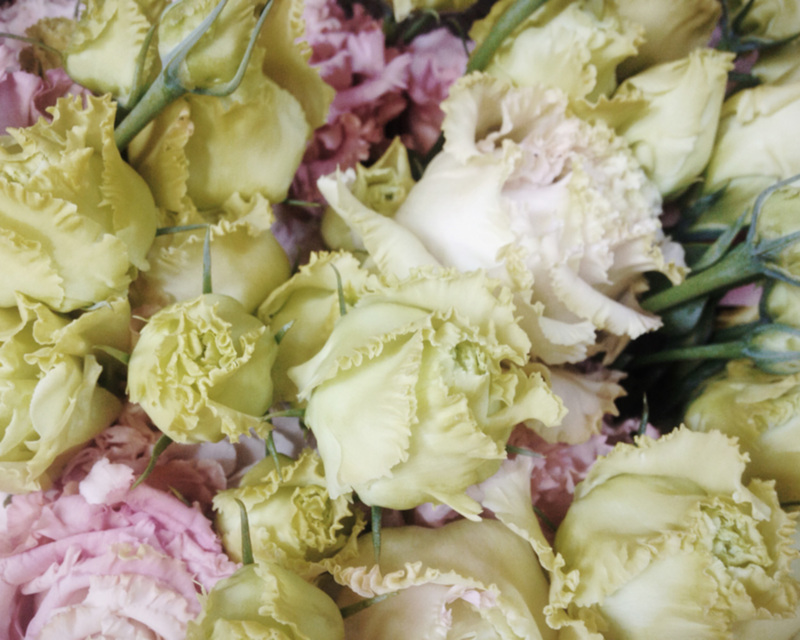 Lisianthus in rose and pale green. Lilacs. 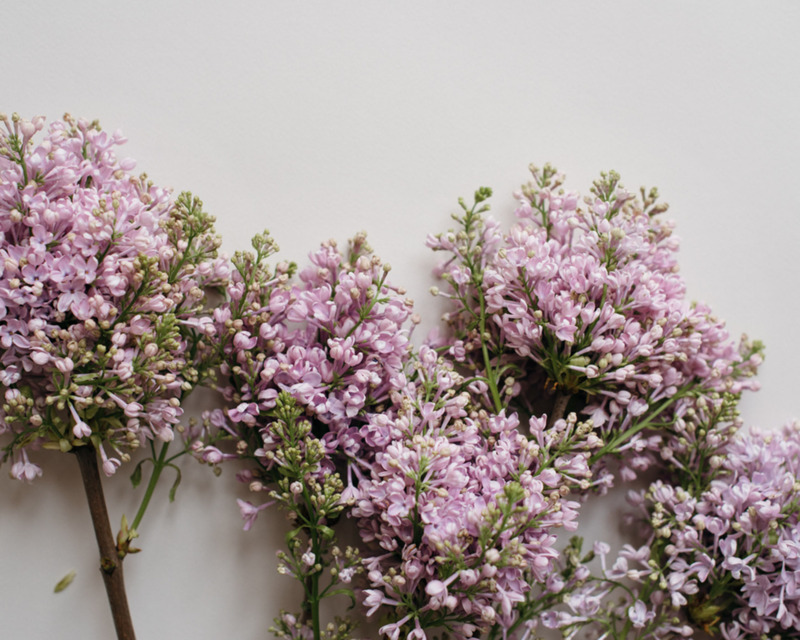 The best time of the spring is when the lilacs trees on our backyard begin to bloom. The first magnolias of the year beginning to bloom on my windowsill. 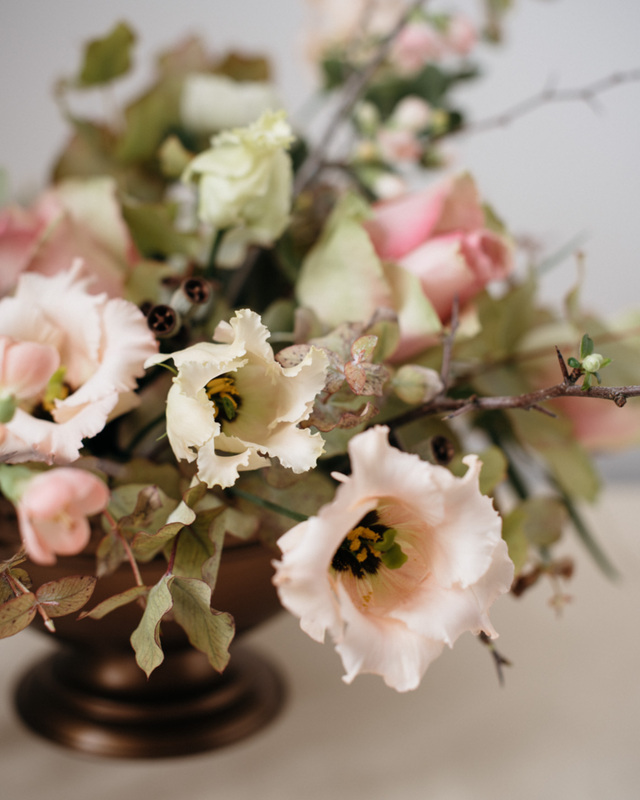 An arrangement by Hanna created with quince, lisianthus, roses and rainbow eucalyptus. 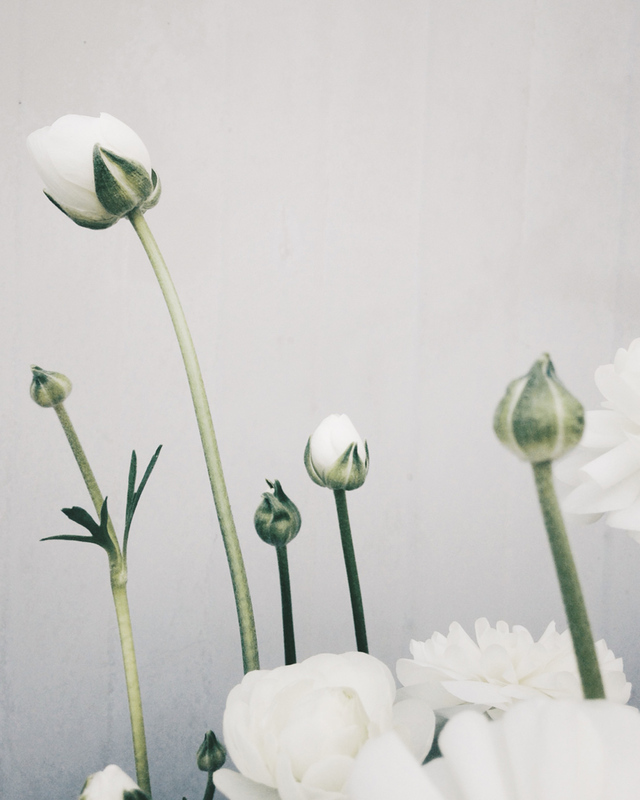 I am so excited to introduce the Minutes Workshops, launching February 12 in Helsinki, with a flower class with floral designer Hanna Piippo. I have known Hanna since my early teens when we took the same dance classes. Born in Helsinki, based in Stockholm and trained in New York, she had successful career in fashion before moving on to study and work with flowers full time. On this class, Hanna will teach the basic ‘chicken wire technique’ often used for naturalistic flower arranging. 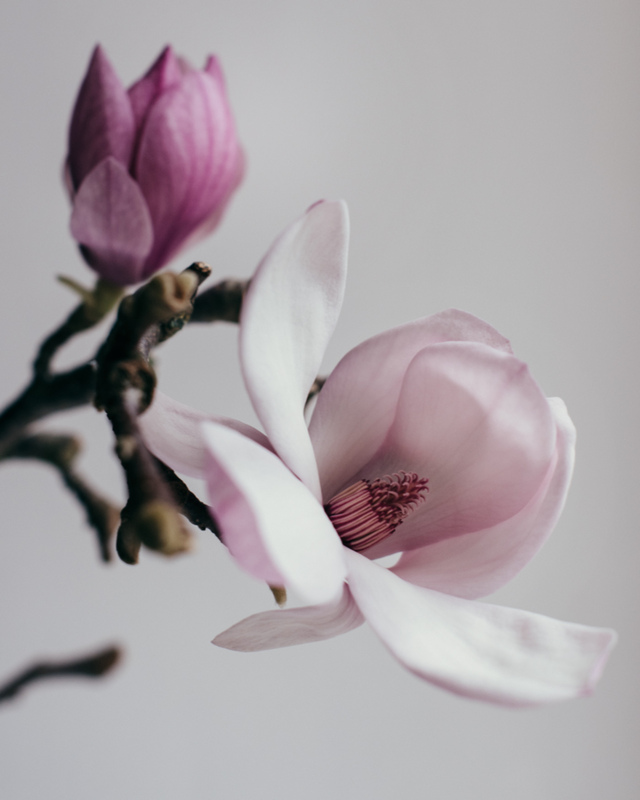 On the spotlight are the first and finest blooms of the season, such as flowering magnolia and cherry branches and lilacs, along with serene beauties like ranunculus, anemone and lisianthus. Besides introducing the characteristics of different flowers and how to handle and care them, Hanna will focus on the creative features: choosing the color palette, paying attention to different shades of green, for example, as well as creating the structure and shape of the arrangement. Beginners get instructions for a shape that looks creative yet is easy to master, while more experienced students will get help and support for challenging themselves by going wilder with the dimensions. Take a look at this arrangement that Hanna created in Copenhagen. I absolutely love the balance of pretty and wild. Teaching is principally in Finnish but anyone is welcome to join. As long as understand some Finnish, Swedish or English, we will make the class work for you. The cost of the class is 150 €. All materials – flowers, snacks, refreshments, vase – is included in the cost. The vase and the beautiful arrangement you created are yours to take home. Since spots are limited and we work with such a precious material, living flowers, payment in full is required to reserve your spot. Payments are non-refundable but if you unable to attend the class, feel free to find a replacement for you. If you would like to attend the class, or have any further questions, please contact me at sara(at)minutes.fi. I can’t wait to get to study flowers with you!